When you’re on the run, there’s nothing better than the one-button arcade game. Titles like Timberman and Super One More Jump thrive on simple mechanics, and Matt Glanville’s Switch ‘N’ Shoot is no different. Sporting a nice pixelated aesthetic and some addictive gameplay, there’s enough here to justify the price tag, even if it doesn’t overpower its competition. 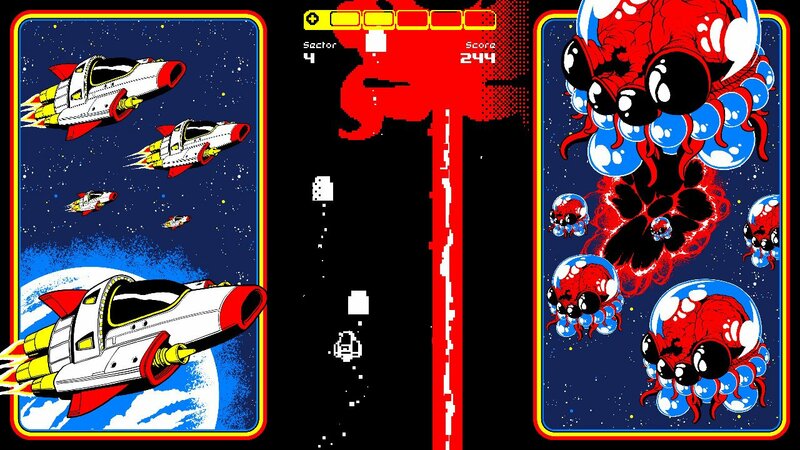 Put simply, Switch ‘N’ Shoot is an endless shooter arcade game where one shot or collision means death. 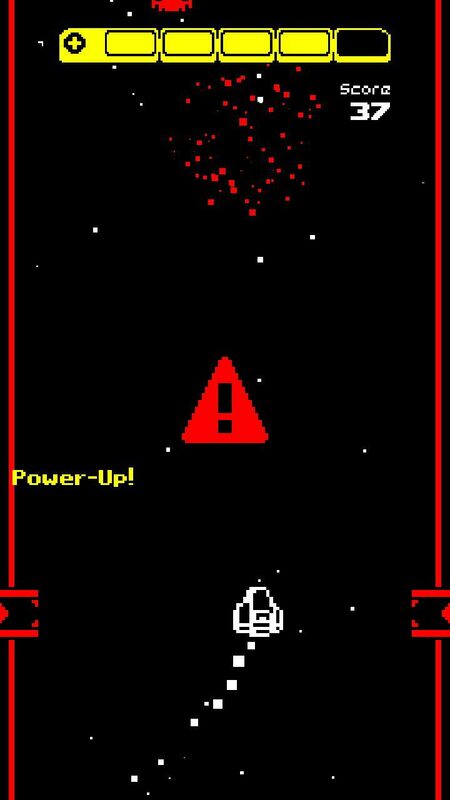 You pilot a randomly named spaceship that will continuously move around the screen; hitting one side of the screen means you pop back out the other one, ala Pac Man. Your sole mechanic is shooting (which is done with literally any button press or by tapping the touchscreen). Shooting will also allow you to move the opposite direction, and you can time your shots to change your path (since the game is an auto-scrolling vertical shooter). Throughout your playthrough, you’ll encounter falling aliens that you must either shoot or avoid, lest you crash into them and die. You’ll have to collect a set amount of power-up coins scattered randomly throughout play, and missing one will cause your ship to de-power. Collecting a set amount of coins will allow you to advance to the next sector, filled with more baddies to destroy, though your powers reset every time. 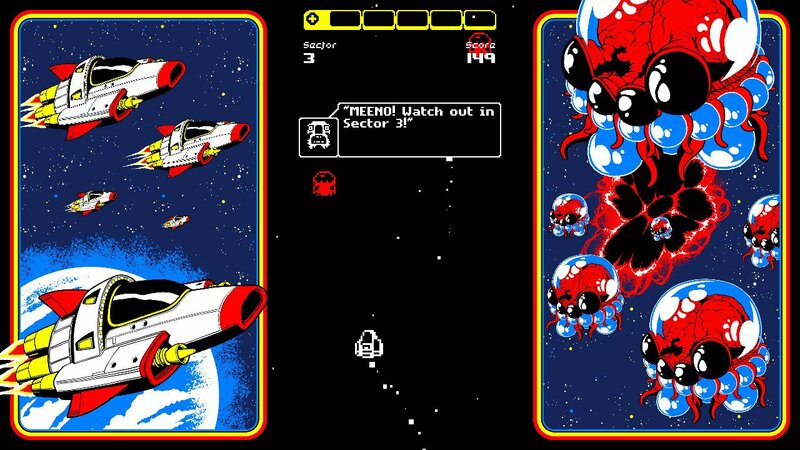 Every fourth sector is filled with a boss alien, which fills up the screen as you try and avoid its attacks in order to continue collecting powerup coins. These sections are tense yet very satisfying to complete. The game ends once you get hit (though this can be averted by picking up a shield power-up that pops up here and there). For a game that’s built on a sole mechanic, it was a fun time that always gave me the “one more go” itch, which is perfect for small games like Switch ‘N’ Shoot. The controls were tough to master, but after getting into the groove of a round for about a minute, I was shooting aliens like crazy, and it was a pretty great experience to have. If there was one thing that I didn’t enjoy about the core gameplay loop, it’s the fact that by not picking up a powerup coin immediately, your ship depowers. While this does encourage strategic play, it does cause someone playing badly to end up dying since you won’t have enough firepower to proceed and shoot the aliens. In terms of technical performance, Switch ‘N’ Shoot does an excellent job running at a very silky smooth pace. There was no slowdown or input lag when playing, and while the game does run with borders if played horizontally, you can easily switch to TATE mode with the press of a button, which shifts the orientation vertically. This means you can play the game with the Flip-Grip or with a stand. However, because it works with the touchscreen, you can play the game like the mobile version. I actually enjoyed doing this, as it increases the size of everything, making everything easier to see. It’s great that a lot of these shooters have the option to change to a vertical orientation, and the Switch is the perfect console to take advantage of it. It’s hard not to compare this game to Digital Devolver’s Downwell, but with a similar artstyle and challenging gameplay, I’ll have to make the comparison here. The limited sparse palette is a stylistic choice that works well in Switch ‘N’ Shoot’s favor, and I feel like adding any more colors would have detracted from the experience (when a new shade is added, it signifies an important item or obstacle to avoid). Less is more here, and it works wonders. If you don’t like the default palette, you can also unlock some special color schemes when entering a new sector for the first time. The music is appropriately energetic and peppy (compared to Downwell’s somber yet urgent tunes), and I wish that there were more tracks than the handful sprinkled about. The biggest problem that the game has in general, however, is the fact that there seems to be a lack of content in relation to the price. While a little less than $5, it’s still pricier than Downwell (which is chock-full of replay value and content unlocks), and the fact that it doesn’t have online leaderboards (local only) or really anything outside the main mode might be a bit of a turnoff for those considering this title. 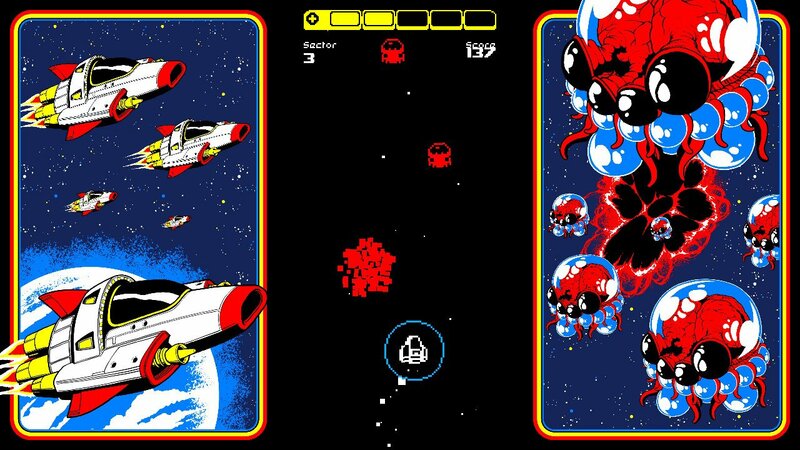 Switch ‘N’ Shoot is a fun little arcade shooter that speaks the language of “one more go!” While it’s limited in its content, this micro-sized game will appeal to the high score arcade junkies out there.